So, I had just written a post on the first international poster for The Dark Knight, a post in which I mention, among other things, that it’s nice to see a piece of marketing for the film that doesn’t involve the Joker. Then I go online and what do I find? 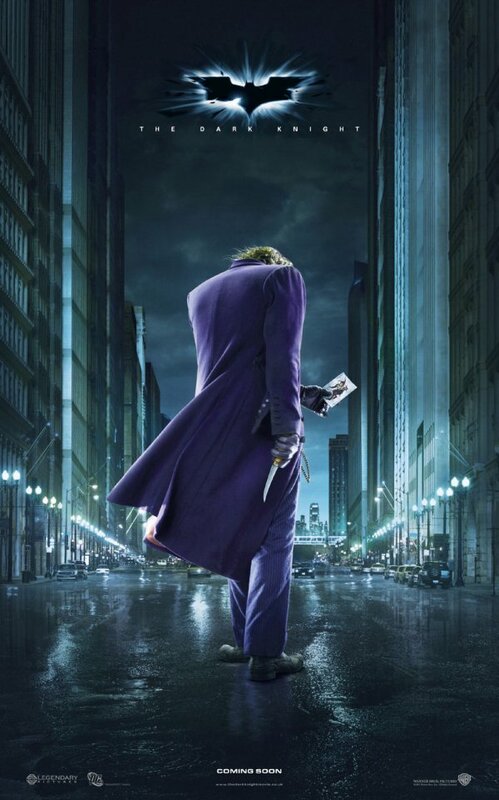 Yes, of course, a new poster featuring the Joker. This poster has a very similar design to the Batman poster. In both posters we see the back of one character and in the background we have a very blue looking city. But the differences are also telling. While Batman is up there in an empty apartment, isolated and watching everything from a distance, the Joker is down on the streets, hitting the pavement and, I’m guessing, preparing to cause some chaos. I like both posters, an I like the way they work together. They don’t show too much or to little. They hint at the confrontation between them, but also contextualize the fact that this dispute happens in a city, and might affect the city irreparably. And, like Dave Davis, I’m glad they abandoned the rust brown they so overused on the posters for the first film. And the truth is that these are just two amazing characters, and the thought of seeing they face each other in a Chris Nolan film is just making me very happy right now.